Seminyak was my last stop in Bali. We stayed at Dash Hotel, which had a lovely rooftop bar with a little pool and was in walking distance to everything we needed. I really liked the hotel and our room there. I personally would have to say I was not majorly impressed with Seminyak, especially after seeing so many other parts of Bali, which were so much less touristy and where you were actually able to experience the Balinese culture. It is very clear that this has been a tourist hotspot for years and years and that most of the tourists coming here want an easy beach vacation and are not interested in seeing Bali. I would compare it to Majorca for Germans, where people basically want to see their own culture just in an area that is a few degrees warmer. 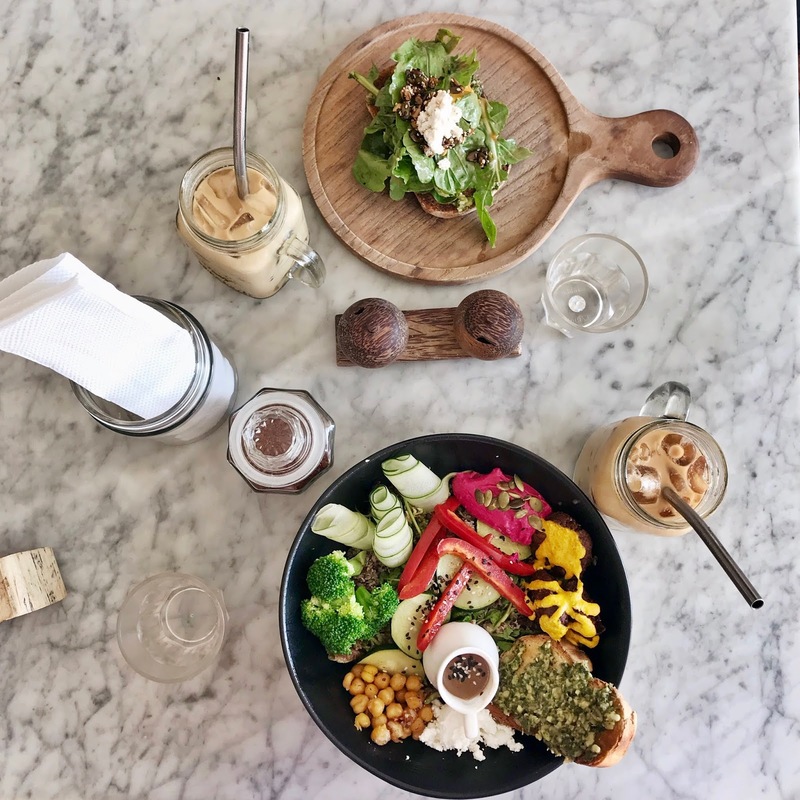 It is ultimately a nice place to simply relax and especially a great place to eat, so this is what I will focus on in this post. This place is the perfect spot for a special dinner. The Asian fusion cuisine here is absolutely divine and will surely surprise you. Ideally you would come here with a large group of people and share as many different plates as possible. We had the duck bao dumplings as a starter and then a Malaysian curry and a pork belly dish. Every single dish was so so good and so different than "usual" Asian food. Make sure to book ahead as tables here fill up quickly! This is one of the coolest restaurant I have ever been in! A huge open bar, mosaics, glass tiles and so much colour everywhere. This is perfect for a girl´s night out or a pre going out dinner. The vibe here is so fun and it is so worth it to go for the interior design alone. And on top of that the food is to die for. Great tacos, divine quesadillas and really, really great guac. Also make sure you try their creamed corn, which may sound weird at first, but is just really, really good. My friend´s absolute favourite in Seminyak and so incredibly good we stopped here for both brunch and lunch. The burger here takes the crown for the best beef burger I had in Bali. 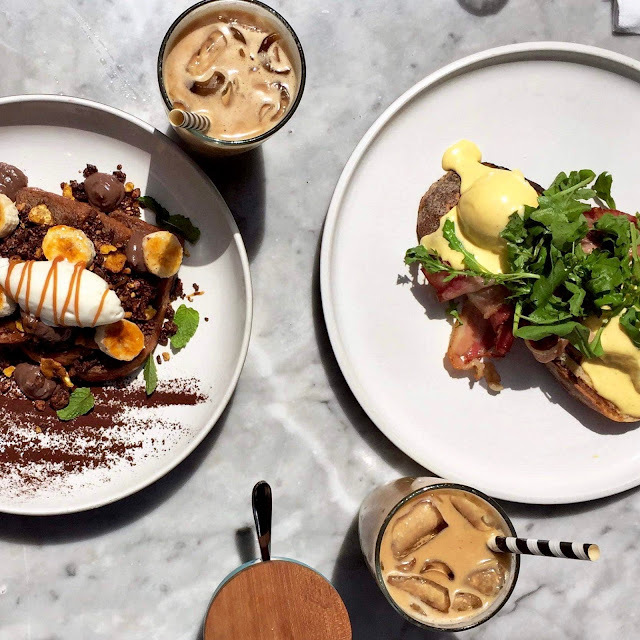 Absolutely everything I saw being carried by looked devine and both my Eggs Benedict, my friend´s chocolate french toast and the burger were so delicious and absolutely gorgeous! Only a five minute walk from our hotel and thus one of our most frequented places, we actually went three times. As the name suggests this place is on the healthier side and their food is so so good! All food is vegetarian or vegan. Their smoothie combinations are so amazing and I can highly recommend their pesto salad bowl and their avocado bagel. Also make sure to get their Antipasti platter! One of instagram´s favourite restaurants in Bali and it tastes just as good as it looks! The beautiful pink interior, outdoor swing and beautifully styled plates explain the success of this place. The iced caramel latte here is still one of the best I have ever had with just the right amount of sweetness. I am always terrified smoothie bowls will not fill me up, but the açaí bowl I had here kept me full for hours and tasted delicious as well! We also had the pancakes, which came with coconut ice cream (say whaaat) and were so good. You can even personalise your bowls and there are super cute post cards for free. In this little restaurant you dine under fairy lights and on little diner like tables. Definitely come here on Tuesdays and get their half priced tacos and the delicious Margaritas. 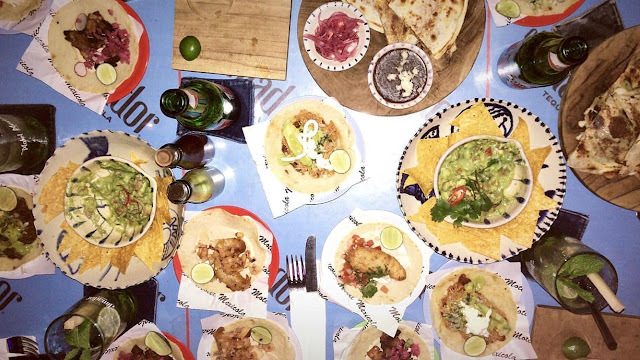 We tried their chicken, fish and pork tacos and loved every single one. 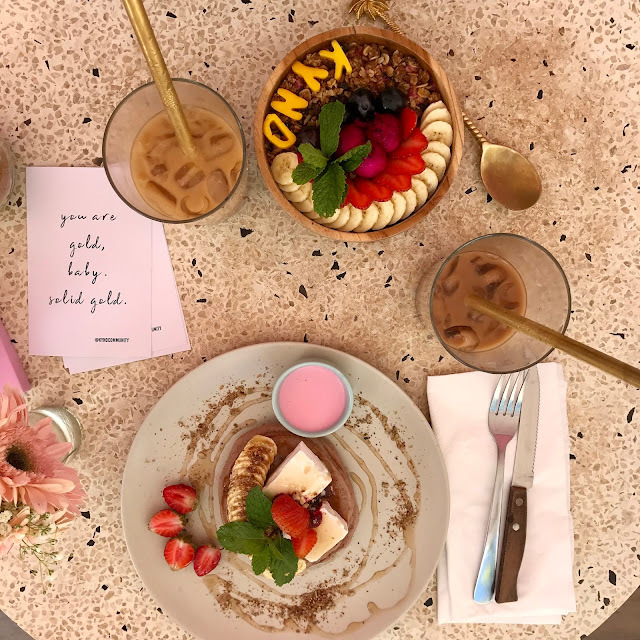 Their brunch is also amazing, they actually mix in cinnamon granola into their smoothie bowls so you get the perfect bite every time and I personally will never get over ricotta pancakes. I also loved the colourful exterior and beautiful outfits of the waitresses! After you finish dinner here, head over to their sister café Neon Palms for reduced drinks. Mainly famous for (duh) their Espresso and brunch, this restaurant is also great for dinner. It has great, great comfort food such as Chicken Wings, Waffle and Polenta Fries and awesome burgers. Definitely get the Mother Clucker, it is one of the best chicken burgers I have ever tried. You can also come here for really creative drinks, especially since the interior is beyond cool with the whole restaurant slightly hidden after massive wood doors and an awesome graffiti wall, as well as lots and lots of chandeliers, candles and neon signs.